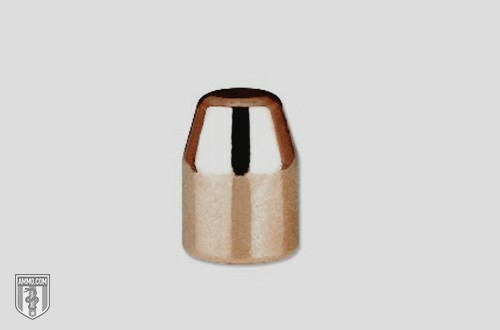 The truncated cone solid bullet (TCSB) can easily be identified because it looks like a solid cone of metal at the tip, with a flat nose at the end of the cone shape. These bullets are prolific in smaller caliber, especially .22 LR, and see a lot of use at ranges or for backyard plinking and varmint control. The solid versions of the TC bullet are just as the name implies – there’s no hollow point or cavities within. It’s typically going to be available in solid lead, though there are some manufacturers out there that make a TCSB with copper. The jacket can vary between full metal jacket and semi-jacketed. Easy Feeding: One of the more noticeable and talked about features of the TCSB is its smooth-feeding nature. It works great in any automatic pistol or rifle due to the shape. And you’re unlikely to get jams or other mechanical malfunctions when you compare this to standard types of ammo with a round nose or other tip. Varied Penetration: Depending on the diameter of the flat nose area, the penetration you’ll get using ammo with a TCSB will vary quite a bit. The smaller the diameter of the flat nose, or meplat, the more penetration you’re going to get – which is why this bullet is used in all types of applications, from hunting to plinking to home defense. Blunt Force: To counterpoint the penetration, the larger the diameter of the flat nose, the more initial “shock” force will be applied to the point of impact. This idea was originally introduced by legendary gun writer, Elmer Keith. It can lead to some pretty impressive displays with backyard shooting and various targets. The flat nose area also helps with paper targets on the range, as it produces a cleaner hole and fewer radial tears on targets, which makes scoring easier. This particular truncated cone bullet sees a lot of action on the range and in backyards. It’s almost always going to be found for handguns, but not so much for rifles. The penetration combined with the initial impact makes it a relatively popular alternative in areas where hollow points aren’t allowed, as this bullet will cause quite a bit of damage and can punch through thicker hides. It’s not going to expand and there’s a possibility of over-penetration, but you can pick and choose from different styles to suit your exact need. Reloaders can also tailor rounds for home defense or concealed carry. Many shooters seem to agree that the TCSB performs better than your standard lead round nose, but does not have the stopping power of a hollow point. This makes it a good choice if hollow points are banned where you live.